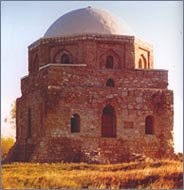 Today we’ll talk about the ancient city of Bolghar — a Muslim shrine. Let me clarify it right away. The Balkan country of Bulgaria and its residents Bulgarians are not directly linked to the ancient state of Volga Bulgaria and its capital city Bolghar. The first historical records of the state date back to the 9th century A.D. Back then Volga Bulgaria was one of the largest and most advanced states in Eastern Europe. Bulgars learned to manufacture pig iron some 200 years ahead of Western European nations. The advanced level of urban development in Volga Bulgaria was quite amazing. Its capital city boasted running water, pavements, and a drainage system. Bath houses were especially popular. There were at least 15 of them in the city. We know what they looked like even today. Archeologists have excavated and restored two of them. Surprisingly, the bath houses had a heating system, hot and cold running water, swimming pools, sewage, and even heated floors. Imagine all that almost a thousand years ago! But it was not the bath houses alone that put Bulgars on the map. Volga Bulgaria adopted Islam as its official religion as far back as the early 10th century, and became the first Muslim state in Eastern Europe. Legend has it that one of the followers of Prophet Mohammed came to Volga Bulgaria. When he learnt that the daughter of the local Khan was taken seriously ill, he plunged his staff into the ground, and a medicinal spring appeared there. Its water quickly healed the girl. The grateful residents of Bolghar and their Khan, astonished by the miracle, adopted Islam. The spring is there still. Today it is inside a well, and its water is still considered health-giving and rejuvenating. At the beginning of the 13th century the Tatar-Mongol armies, having conquered Middle Asia, seized Volga Bulgaria as well. A few years later Bolghar became one of the major cities of their vast empire — the Golden Horde. Moreover, it, too, adopted Islam. Today, a thousand years later, most Tatars are Muslims, the ancient Volga Bulgars being their direct ancestors. Three hundred years ago Bolghar was part of the Golden Horde. Mosques, minarets, crypts and mausoleums, unsurpassed in their beauty, were built on its territory. The city continued to grow and prosper. Located close to the confluence of the two great rivers the Volga and the Kama, it became a major center of trade between Europe and Central Asia. But sooner or later everything comes to an end. Discord among the leaders of the Golden Horde led to the gradual weakening and disintegration of the once great and powerful empire. Bolghar, too, eventually declined. In the 16th century Russian princes took advantage of the situation, seized Bolghar and integrated the entire territory of the former Volga Bulgaria into Russia. In the early 18th century Russian tsar Peter the Great visited Bolghar and saw the lamentable state it was in. He ordered large-scale restoration work on the city’s architectural monuments. The Tsar’s ukase, or decree, was the first state document on preservation of historical monuments in Russia. Regrettably, the Tsar’s decree didn’t help much. It was not the restorers or the scientists who rushed in and made themselves busy in Bolghar, but the treasure hunters. In search of treasures they dug through well-nigh the entire city. There is no information about any valuable finds. However, their diligent efforts caused the collapse of the main minaret of Bolghar as well as other stone buildings in the city. The most enigmatic of them all is the so-called Bal-Bal. It is a human head made of stone with clearly mongoloid facial features. It was found in one of the khan’s crypts. Scientists estimate it was sculpted as early as the 13th or the 14th century. That is at the time when Islam had already been officially adopted in Bolghar. But Islamic laws forbade depicting faces of people, let alone those of saints. Who then does Bal-Bal personify? Could it be one of the pagan idols of the tribes who inhabited those parts long before the foundation of Bolghar? Today Bolghar is a museum under the open sky. The main minaret that collapsed long ago has been rebuilt. Crypts and mausoleums that have miraculously survived have been restored. Little by little other buildings are being restored too, the famous bath-houses, for one, that we spoke of above. This historic spot of stunning beauty keeps attracting thousands of tourists, who come here in droves, especially in the summer season. They come not only from Tatarstan, but from Central Russia, Western Siberia, and many foreign countries. Almost every one of them will walk around the remnants of a column that mark the place of the magnificent mosque that used to stand there a long time ago. Walking around that column several times is a ritual that is believed to fulfill one’s innermost desires. Today Bolghar is also a place of pilgrimage for many Russian Muslims. They come here to perform the so-called “little hajj”. Mostly, these are the believers who haven’t had a chance to take part in the big hajj in Saudi Arabia. Beautiful. Some of the architecture reminds me of the church and monastery at Grachanitsa in old Serbia. Most of the frescoes and artwork were destroyed in the last ten years. Makes me want to weep.